measX (Mönchengladbach, Germany) has released version 11 of DASYLab Data Acquisition System Laboratory. Designed for those who want to get down to work straight away, without having to write programs, DASYLab 11 is now available from Adept Scientific (Letchworth, Herts). 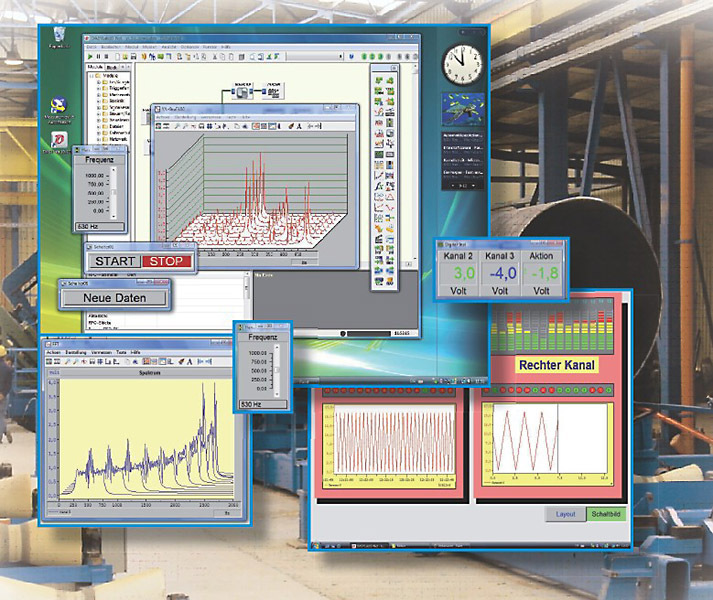 Its simple, point-and-click interface lets you set up powerful, sophisticated data acquisition routines quickly and easily allowing you to create your own individual measurement or analysis application in a few minutes. DASYLab 11 is supplied and supported by Adept Scientific in the UK and Ireland. February 2009: Adept Scientific (Letchworth, Herts) has released its training dates for data acquisition and DASYLab which will be held in its purpose built training suite at their Letchworth premises. This course is the best route to ensuring delegates get the most from their data acquisition hardware and DASYLab software in the shortest possible time. Designed for anyone whose work involves collecting data from transducers and sensors using a notebook or desktop PC, the course provides an unbeatable introduction to PC based data acquisition using DASYLab for quick and efficient software configuration to produce results immediately. • Saving data for subsequent import and analysis in Excel and other analysis tools including SPC. We can also bring this course to you at your site and tailor the content to suit your specific application. Please call +44 (0) 203 695 7810 or email info@alfasoft.com and ask for more information about onsite training or DAQ consultancy. Adept Scientific (Letchworth, Herts) brings you DASYLab 10, the latest version of the powerful and easy-to-use tool for data acquisition and analysis, from measX GmbH & Co (Mönchengladbach, Germany). DASYLab is designed for those who want to get down to work straight away, without having to write programs. Its simple, point-and-click interface lets you set up powerful, sophisticated data acquisition routines quickly and easily. With DASYLab you can create your own individual measurement or analysis application in a few minutes. DASYLab 10 has many new features which makes the software even easier to use. With improved efficiency, DASYLab 10 is now supported on Windows Vista* (32 bit), Windows XP SP2 and Windows 2000 SP4. The Action Module has a new ‘channel order’ option to define a set order for actions. A new display module called Diagram, which combines features of the Recorder, Y/t and X/Y charts, providing new and more flexible ways to display data. The Write Data Module has enhanced support for the DIAdem TDM data file with an additional 50 custom properties for data channels and groups. Global string variables can be created outside of the Action Modules. A unique VAR file stores the global variables and strings for each worksheet to eliminate accidental transfer. DASYLab 10 includes detailed analytics on every DASYLab module within a running worksheet. It is now possible to generate documentation for a DASYLab sequencer file. The enhanced module allows for separate data channel switching. The Modbus modules Analog Input and Digital Input work with modified interface behaviour to provide measurement data. The help sections for the modules groups Trigger functions, Statistics, Files and Special have been completely revised. Many new and expanded drivers are available. See http://www.dasylab.com/ for details. Now creates an independent thread that is managed outside of DASYLab preventing email problems interfering with DASYLab. Adept Scientific is pleased to announce the release of the DASYLab 9.0, the latest version of the powerful and easy-to-use tool for data acquisition and analysis. DASYLab 9.0 is designed for users who want to start work straight away, without any programming effort. The software performs data acquisition, visualisation, open and closed loop control, and documentation. With DASYLab 9.0 you can perform all these tasks interactively on the screen. Symbols represent functions, and you can link them in worksheets according to the task at hand. The DASYLab user interface has been completely reworked for Version 9.0. The major innovations are the restructured workspace and the modern module icons. The block diagram area, where the measurements are still defined and configured, now includes useful browsing and information areas. Module browsing provides various views of all the available modules and Black Boxes, and of the modules that are used in the current block diagram. The new status console is the reference for the running and status of the program. All these additions make data acquisition and evaluation with DASYLab even easier. To debug measurements you can use the Signal Spy, which displays progress information about the signals that are transported between the modules in a block diagram. The information includes descriptions and an oscilloscope diagram of the signal. One of the major advantages of DASYLab has always been the wide range of measurement and control hardware it supports: for Version 9.0, this range has been extended. A series of new drivers now supports the National Instruments M series and CAN boards made by IXXAT. The drivers have been reorganised to facilitate hardware selection and assignment. Many new features and additions to existing features in the various modules complete the new version. Available from Adept Scientific, DASYLab 8 is the latest version of this popular Windows-based graphical data acquisition software that speeds the set-up and development of measurement and analysis applications. A new Quick Start Guide has made it even easier for new users to start working with DASYLab 8. This interactive tutorial takes users step by step through the process of creating typical worksheets. There are 120 embedded demonstrative examples, which can be opened in a second window for testing alongside an engineer’s own worksheets. There are numerous improved usability functions that quickly enable engineers to customise DASYLab 8 to fit with their particular applications and systems. For example it’s now possible to customise the user interface for easy access to menu functions that are used most. The software now features eight user-defined buttons on the front panel for one-click access to any function and customisable “hot keys” that engineers can use to assign DASYLab functions to their keyboard. Version 8 also offers the facility to fine-tune the default settings for modules to your exact requirements – a great time-saver. Once the settings for a module are defined, each time a new module of that type is created, it will be configured to use the saved settings. Use the new global overview of variables and strings to easily and quickly explore the instances where variables or strings are used in the worksheet; DASYLab also highlights any potential conflicts in red. Take advantage of new modules including, the new Polarplot module, which enables engineers to create polar plots using polar coordinates and X-Y coordinates, or the New Action module to create Bitmap snapshots of VITool pages while DASYLab is running. The software includes more than 10 new and updated measurement hardware drivers that support varying acquisition rates for each device. DASYLab 8 also adds support for low cost USB CAN (Controller Area Network) devices including a new CAN logger module for storing all CAN traffic to file. From research and development to production test and quality control, engineers use DASYLab to quickly create flexible and powerful measurement and analysis applications without programming. Using DASYLab, engineers can quickly acquire data from PCI plug-in cards, USB and Ethernet data acquisition devices togther with industry-standard OPC compliant devices such as PLCs. In addition DASYLab’s ICOM module provides connectivity to instruments from hundreds of vendors over RS232 and TCP/IP. DASYLab 8 supports the latest Microsoft Windows Operating Systems. DASYLab 8.0 is supplied and supported in the UK and Ireland by Adept Scientific plc, Amor Way, Letchworth, Herts. SG6 1ZA; telephone +44 (0) 203 695 7810, fax +44 (0) 203 695 7819, email info@alfasoft.com; or see Adept’s World Wide Web site at http://www.adeptscience.co.uk/. DASYLab has made setting up PC-based data acquisition systems easier and faster than ever before. And it doesn’t take a programmer or prior knowledge of working with this kind of graphical data acquisition software to be able to use DASYLab straight away – it comes with an excellent ‘getting started’ tutorial and is extremely user-friendly. But if money is tight, and the full version of DASYLab is a little beyond the budget, it’s no longer necessary to make do with a more ‘clunky’, less usable software alternative. Now with a new lower price, just £425 plus delivery and VAT, DASYLab Lite is the most affordable way to access the acclaimed functionality and ease of use that makes DASYLab the first choice for Windows-based data acquisition. It takes just a few minutes to create individual applications with DASYLab and even the most sophisticated acquisition and control tasks can be solved with DASYLab quickly and without any programming. All that’s needed is to connect graphical icons representing the hardware, the signal processing and the chosen display. Users can benefit from real-time display and logging, a pre/post trigger module to make it easy to capture areas of interest in your data. DASYLab Lite also supports RS232 inputs and has a wide range of displays including Chart Recorder, Y/t Chart, Bargraph and Meters.